If you've ever traveled in the wrong clothes, it probably left you thinking never again, right? I, for one, am very much guilty of choosing travel outfits in the past simply because they were cute, eventually kicking myself for it mid-route. But I've realized that looking cute and dressing in clothes that allow for mobility can be synonymous. Recently, I've come across several pieces that fit the bill perfectly. When I travel, I look for pieces that I can layer and that won't take up a lot of room in my carry-on tote if I need to remove them. And as much as I love to wear shrunken leather jackets and 100% cotton jeans, they make me miserable when traveling. Luckily, fashion brands understand that we now live in a world in which comfort is paramount, and they design accordingly. Keep scrolling to shop the new clothing items on the scene that will solve all of your outfit-related travel conundrums. 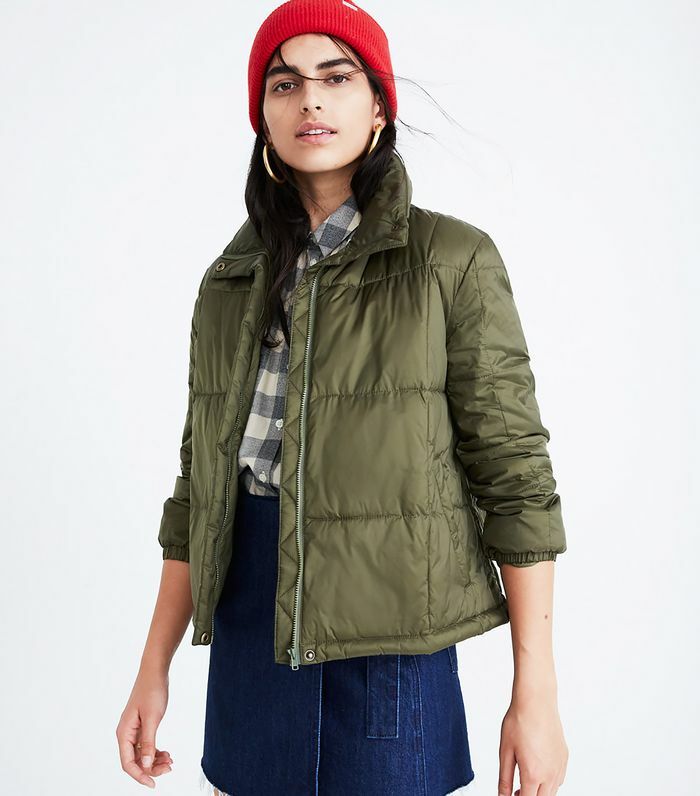 This cute puffer is lightweight yet warm and doubles as a neck pillow. Genius. These are Re/Done's stretchiest jeans yet, and I'm in love. Outdoor Voices' new fleeces are perfect for plane naps (and look great with leggings and skinny jeans). Alo's Lounge Leggings are more comfortable than most leggings, and that's saying a lot. You won't need to tote around a coat when wearing this cozy sweater, and the turtleneck is removable. If you prefer to travel in a dress, this one would look great with sneakers and a chunky cardigan. This cool jacket features a removable shearling lining. There are so many good cardigans right now, including this one. Chicest sweatpants on the planet. These legging pants are genius for when you need warmth and a little extra polish. This jacket is incredibly lightweight, but it's lined with sherpa for extra warmth. Plus, the collar is removable. Depending on your shoes (and personal preference), these wide-leg jeans can be cinched at the ankle or worn wide-legged.